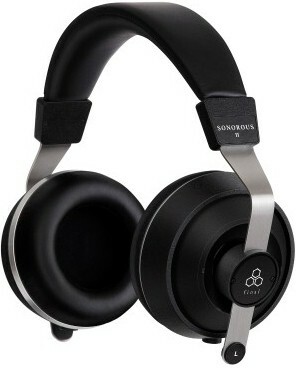 Sonorous II entry-level model with the same design approach acquired through Sonorous X for similar sound quality from a lightweight and considerably lower-priced headphone. Earn 264 loyalty points when you order this item. Sonorous II excels in terms of high-frequency harmonic overtone reproduction and features ear pads with an internal sound absorption section that contribute to clear sound quality. The flagship model Sonorous X employs a driver unit integrated with the front plate, which results in resonance being suppressed and clear sound quality. With the same titanium diaphragm employed with Sonorous X, the Sonorous II model excels in the generation of high-frequency harmonic overtones, achieving high-resolution sound. The ear pads play an important part in sound quality. When there is a space between the ear pad and the ear, low-frequency acoustic pressure change greatly, and this greatly influences sound quality. So as to achieve a superior fit where it is hard to create a space, Final Audio employed synthetic leather, which has an equal amount of flexibility both horizontally and vertically and have chosen a sponge with just the right amount of flexibility. Establishing apertures on the inside and the outside of the ear pads makes for clear sound quality with sealed headphones. A BAM (Balancing Air Movement) mechanism developed for balanced armature drivers has been employed with a dynamic driver. With BAM, the idea is to optimize the pressure balance between the front and back of the diaphragm. With Sonorous II, Final Audio has applied even more precise tuning based on knowledge obtained through the development of Sonorous VIII and Sonorous X.
BAM optimizes airflow inside the housing through the creation of an aperture in the driver unit, which is usually sealed. While achieving bass tones and deep, three-dimensional spatial representation, which proved difficult with single driver full-range reproduction, the engineers achieved a BA type that at the same time is made for natural listening the user doesn't tire of. With Sonorous X, the flagship model of the Sonorous series, the integrated driver unit with the front plate suppresses resonance as well as realizing clear sound quality. The housing employs hard resin comprised of hard polycarbonate strengthened with 30% glass added to it. Resonance is suppressed and clear sound quality is achieved. Titanium has been employed for the diaphragm. This plays a role in enhancing resolution and the generation of high-frequency harmonic overtones. A metal plated monaural plug with a diameter of 3.5mm is employed for the connector on the headphones. By employing a connector with a long track record, trouble resulting from poor connection through changes over time is avoided. This is a cable with a locking mechanism that rotates 90 degrees. It features a detachable 1.5m cable with locking mechanism.